Soft-roaders aren't exactly a new phenomenon. And we Indians love them big and brawny. Whether there's substance to all that show is a different thing altogether. As long as there's street-cred, we're a happy bunch. And this market is bursting at its seams. Look around; see how many pseudo off-roaders are doing the school run every morning, and you'll know we aren't kidding. Now if your noodle is in place – and there's no reason why it shouldn't be – you'd be a bit daft as a manufacturer to not want a piece of the soft-roader pie. The latest entrant to this party is the Renault Duster and it's given us a great excuse to gather its rivals – the Mahindra XUV 500 and the Skoda Yeti for a bit of a stand-off. We were quite impressed with the Duster the last time around, but with the Yeti and the overbooked XUV 500 being quite the able sport utilities in their own right, we figured it was time to pitch them together to see which one of these softies really deserves school-run duty. Let's begin with the Duster. It certainly has street presence, with all that chrome upfront. It looks good, certainly more manly than the other two. Those boxy lines do its SUV image well. The XUV's cheetah-inspired design looks pretty good too especially in flesh. Some bits may make you think the designers went overboard, but the end result still warrants a second look. Speaking of second looks, there's also the Skoda Yeti. It's been around for a while, it isn't exactly fresh but it doesn't look dated either. At first, we thought it was a bit quirky. But the Yeti has grown on us and we now quite like the way it looks.Although their purpose may be the same, all three take different routes to get there. On the mechanical front, the lines start to get blurry. The XUV gets a 2.2-litre engine good for 140bhp and 330Nm. It's the same mHawk powerplant from the Scorpio, only with 20 more horses and a six-speed 'box. It's quite refined as far as vibrations go, but mechanical clatter does make its presence felt. But once at speed, the noise isn't intrusive. Performance-wise, the XUV defies its weight, but that's only once you figure out how to extract its juice. Throttle response below 1800rpm isn't the best, but past that mark, the XUV has a spring in its step. Zero to 100kph is dispatched in 12.3 seconds. In the city, its turbolag shows, making you work the gearbox. But show it some open road, and the XUV makes light work of it. This car has the highest displacement and it shows when you're out on the highway – it feels effortless and the least strained at higher speeds. Fuel efficiency? Expect it to return 9.5kpl in the city and 13.5kpl out on the highway. Renault's Duster has the smallest engine of the lot, displacing a relatively tiny 1461cc. But don't go by size – it puts out a healthy 109bhp and 248Nm. This engine also does duty in other Renaults, including the erstwhile Logan. They've managed more horsepower by bolting on a bigger turbo, but a bigger turbo generally means more lag, and the Duster follows this general thumb rule. There's noticeable lag under 1800rpm, but performance isn't bad once you're in the meat of the band. It may not be as powerful as the XUV, but the Duster's secret is its relatively low kerb weight. Zero-100kph takes 11.76 seconds. You'll not be short of performance, but the turbolag is irritating in bumper-to-bumper traffic. The Duster likes the highways better. The smaller displacement helps fuel efficiency – 11.8kpl and 16.5kpl in the city and highway cycles respectively. The Yeti gets the same 2.0-litre TDI engine found in the 4x4 version, just that it’s detuned and puts out 110bhp and 250Nm. Refinement is decent, but pushed to the redline, it tends to get boomy. Unlike the diesels you’re used to, the Yeti is quite easy to stall, so you need to throttle it a bit to get off the blocks. Apart from that, the engine is quite tractable. It may only have a five-speed gearbox, but clever gearing ensures you don't really miss the extra cog. In the city, you'll feel throttle response below 2000rpm isn't great, but the ratios ensure you don't spend too much time lugging the engine around. As a result, the lag doesn't matter much. It's mid-range is quite meaty and it's best to ride the torque wave from 2000rpm to 3500rpm. This wave ensures the Yeti gets to 100kph in 11.55 seconds and manages a top speed of 180kph. TDIs are inherently fuel efficient and the Yeti doesn't disappoint. It'll do 12.1kpl in town and 19.1kpl on the highway. If you want a clear winner in the engine department, we'll go with the Yeti. It's quick, flexible and efficient. So we know about the engines, but soft-roaders should drive like cars. So we took them to our favourite neighbourhood expressway. As you hit the highway, one thing becomes clear – the Duster and the Yeti are in a different league altogether. Which is not to say the XUV is bad – it's good, indeed it is the best Mahindra yet, but it still has some way to go to get to European levels of ride and handling. The XUV's weakness is its weight, which is substantially more than its rivals. This makes it that much harder for the engineers to tune its suspension. Bump absorption ability is good, straight-line stability is also pretty good. But you can't ignore the weight transfer every time you hit a bump or pile into a corner. As a result, understeer happens fairly early and you can't point-and-shoot as much as you'd like. The steering feels a bit too light and doesn't have the feedback you'd expect. The XUV's road manners are perfectly acceptable, but when push comes to shove, it just doesn't feel as taut as the other two. 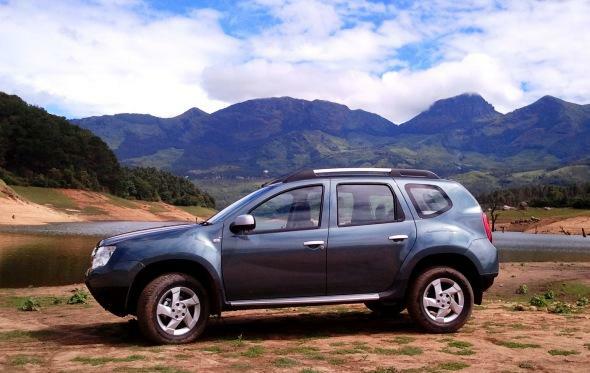 The Duster on the other hand, impresses as soon as you start driving it hard. Ride quality is exemplary and it absorbs most potholes without batting an eyelid. And not at the expense of handling. The Duster doesn't have qualms about changing direction quickly. The steering provides loads of feedback, in fact a little too much, which sometimes makes you back off on corners. But there's no denying the fact that the Duster has the best ride-handling compromise. In fact, we won't even call it a compromise, because unless you want BMW handling, the Duster will not give you reason to complain. The Yeti is another impressive handler. The suspension set-up is harder than both the XUV and the Duster. This means ride quality has a slight stiff edge to it, especially at low speeds. As a result, expansion joints and sharp edges make their way into the cabin. But this gets better as speeds rise. High-speed stability is the best of the lot. Harder springs also pay dividends in handling. The steering feels the best of the lot and weighs up nicely with speed. It's also the most agile and doesn't hesitate to change direction even if you're being an idiot behind the wheel. Off-road scores for both the Yeti and the XUV aren't great thanks mostly to their low ground clearance. And since we're testing the two-wheel drive versions, it's best to keep a tow-rope handy if you're going to venture off the beaten path. But if you must get your wheels dirty, you're probably better off doing it in the Duster. Its high clearance and big wheels make it less likely to embarrass you. As of now, the Yeti and the XUV are available with all-wheel drive versions. Hopefully, in the near future, there'll be a four-wheel-drive option on the Duster too, which will make it more appealing. Inside, these cars are as different as chalk and cheese. The Mahindra is not only big on the outside, it's big inside as well. It's the only seven-seater here. Cabin quality is decent, but not a patch on its rivals. The colour combination inside is, ahem, an acquired taste and borders on tacky. But there's some solace because Mahindra has crammed the XUV with features. You get everything from cruise control and touchscreen display to auto wipers and auto headlamps. The Duster's chocolate brown-and-beige combination cleverly hides a cabin that is smaller than its rivals. Although the seats are comfy and have enough room in front, the rear passengers will feel shortchanged. They'll feel cramped especially if there are taller passengers upfront. The air-con tower in the centre doesn't help matters and robs the rear centre passenger of legroom. Equipment levels in the RxZ are generous and you get lots of kit, but it doesn't match the XUV's segment-leading equipment list. The Yeti's interior on the other hand is no-nonsense, and not in a bad way. Cabin quality is better than in the Duster and the XUV. But its equipment list isn't as long as the others'. Still, all the essentials are there. And even though they may trump it on equipment, the Yeti feels a lot more upmarket than the other two. The fully loaded W8 FWD XUV comes in at Rs 14.56 lakh (on-road, Mumbai). At that price, and given its sheer load of equipment, it’s strong value for money. The Duster RxZ retails at Rs 14.33 lakh (on-road, Mumbai). The Yeti, at Rs 17.27 lakh (on-road, Mumbai) for the Active 4x2, is the most expensive of the three. But there are good discounts going. As a package, despite that hefty price tag, the Yeti is a great buy. It has the most car-like feel to it. For your money, you get excellent build quality. The Yeti’s feature list is not something to brag about, but it has all the necessities. The XUV may do well in the value-for-money stakes. And the Duster makes a good case for itself as an urban SUV. But if you really want an all-rounder, the Yeti is the one we’ll pick every time, despite that stiff price tag. The source of This Post is BBC TopGear . Renault Duster is a righteous choice for people who wants to buy SUV.Now in premium SUV series it will give a tough competition to the Pajero,Outlander,X-trail and Safari and Skoda Yeti. Yeti's Looks keeps on growing as u see it again n again, similar to A R Rahman's songs, you keep listening n u ll like it more. As far as Performance is concerned i think Yeti is the right combination though i don own one. But if am to about to choose one from the lot, its none but the Yeti. Very nice article sharing Skoda Cars.If anyone wants to Buy Skoda Yeti Tyres Online then visit our site Tyreonwheels and get tyre in lowest price.